Felting can be a lot of fun, part of the fun is that until you have actually felted the item you can never be certain just how it is going to turn out. For a start the fiber texture will change, then of course the shape will (or won't) form and this can be a little different that expected. Whether you knit or crochet the basic technique is the same. First you make the item, usually using a larger needle/hook than the yarn would normally call for, then you throw it in a washing machine on hot. Sounds simple enough! The key to success is often in choosing the right yarn. 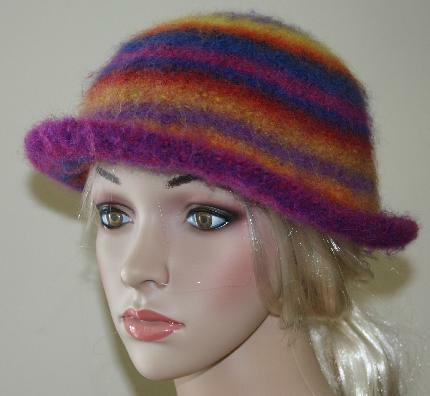 Pictured above is Ivy Brambles Sausalito Felted hat. Ivy Brambles doesn't have a suitable feltable yarn so they chose Acacia Yarns Supersoft Merino. This is a self striping yarn, single ply, and very soft. Idea for felting projects. The yarn is normally knit on a 7-8 needle but this pattern calls for a significantly larger size 10 1/2 (6.5 mm) needle. Before felting the hat was very tall and the brim quite floppy. We are pretty sure that if we were to take a survey at this point very few would have said that the hat would turn out the way it did, which was pretty much exactly as designed. Sausalito is a knit hat and was made using easily feltable yarn. So what would be the difference if it were crocheted or if we used a blended yarn, like an acrylic or silk blend? Crochet items will indeed felt, although not as much or as easy as knit items. Part of the reason for this is the knots in crochet which reduce the friction during washing. Similarly a tight knit garment will tend to felt less. When crocheting an item for felting anticipate less shrinkage than when knitting, allow longer washing times, and don't be surprised if you can still make out the stitches, you usually can't with a knit item. Most important of all use a yarn that will felt really well, the best yarns are soft single ply yarns, like Supersoft Merino from Acacia Yarns!